Call to place an order! Or stop by and check out our store! 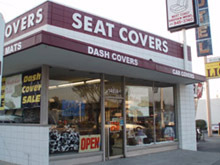 Seat Covers US, one of the largest companies on the West Coast to offer sheepskin seat covers made of both sheepskin and man-made fibers, was founded in 1982 in Whittier, California. We offer semi-tailored or custom-made seat covers made of the best sheepskin, wool blend and velour available in the world. 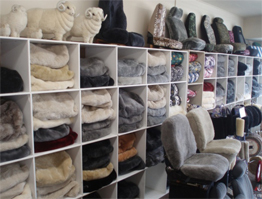 Our sheepskin is imported from New Zealand and Australia, the finest products available. We produce all of our items in our state of the art 5,000 square feet production site. Some of the products we offer include car seat covers with a variety of colors and styles such as cow prints, leopard prints, giraffe prints and cheetah prints as well as aztec prints. We also manufacture car accesories such as floormats, dash covers, car covers, steering wheel covers and seat belt covers. We also produce sheepskin booties and rugs. Our products can be manufactured to fit any size car, truck or van and we only use the best material and equipment available in the industry. Plush, genuine sheepskin provides a thick cushion of natural wool fibers between your body and car seat, greatly relieving the pressure points of your back, waist and thighs. Why do you think so many hospitals, airplanes and commercial drivers use genuine sheepskin? Simple: sheepskin is the best natural product available to provide soothing, relieving comfort. Also, this cushion of air and wool fibers provides natural insulation, keeping you cooler in summer & warmer during winter. Genuine sheepskin is incredibly durable and offers the longest lasting, most complete protection available for your upholstery. Your seats are constantly subjected to your body movement while driving and while sliding in and out of your car. Your seats are also targeted or soiling from kids, pets and foot. All sheepskin seat covers are guaranteed against defects in workmanship and materials for one (1) year from date-of-sale to the retail customer if cleaning instructions are followed. This limited guarantee applies to the first retail purchaser only and excludes normal wear and color lightening and color change (see below). Liability is limited to the repair or replacement of the defective item. Any other expressed or implied warranty, including any implied warranty of merchantability or fitness, is limited to one year from date of purchase. Some states do not allow exclusion of consequential damages or limitations on implied warranties, so the above restrictions may not apply to you.